For the AI counterpart, see Siren (Killing Floor 2). 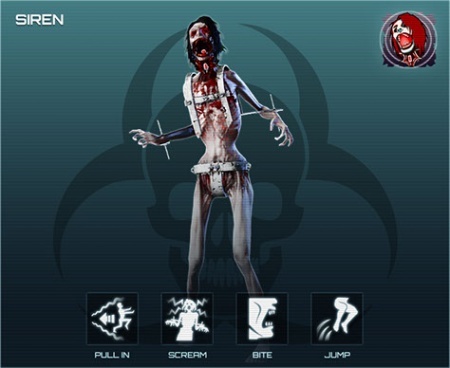 The player-controlled Siren is one of the playable ZEDs in Killing Floor 2's Versus Mode. The Siren is a supportive unit of the ZED team, capable of causing significant amount of the damage to the group of Survivors as well as to immobilize and isolate a lone targets by using her special Vortex attack. Due to Game Conductor mechanics, player-controlled Sirens have their health modified based on the average level of the Survivor team. Values vary within (x0.85 - x2) range. Player-controlled Sirens resistant to all types of the damage except for very few cases, however they are less resistant to damage from certain tier 1 weapons. By various amount, Sirens are resistant to all types of the damage but most notably against toxic. Sirens resist to every type of ballistic weaponry, without significant cascades in the multiplier values. Sirens are vulnerable against Firebug's Caulk n' Burn and heavy (blunt) attacks of Berserker's Crovel Survival Tool. Sirens are neutral against Commando's AR-15, drastically vulnerable against default 9mm Pistol and Field Medic's HMTech-101 Pistol and are slightly weak against certain shotguns. Sirens have two weak spots, which are the head and the neck. Although the damage multiplier of head zone is lesser than for the neck it still worth aiming for the headshot as Siren's head has roughly twice as less health than body. Sirens wear a metallic plating over their bodies, which reduces the damage when they are shot in the chest and hips, acting as a crude bullet-proof vest. Primary: Scream, an area of effect attack that damages multiple targets at once. Secondary: Vortex attack that pulls Survivors towards the Siren and renders them unable to move and attack. During this attack Siren cannot move. Bash button: Melee attack, Siren uses her teeth to bite the players, two hits combo per attack. Melee. Damage - 13. Maximum hit range - 1.8m. Vs doors - x5 more. No cooldown. Normal scream. Damage - 15. Radius - 8m. Falloff - 1 (linear). Frequency - 0.5s. Cooldown - 2.5s. Vortex scream. Maximum grab range - 12.5m. Duration - up to 5s. Cooldown - 12s. Grabbed player takes 4 damage / s.
Melee - x1 (up to 2 hits). Player-controlled Sirens start spawning at the second wave of the normal versus game. Walking Siren is the slowest player-controlled ZED and her sprinting speed makes her the second slowest ZED after the Bloat.